I’ve been translating a lot of handwritten doctor notes lately. I expect you’ve heard the old story about the person who received a personal letter from a doctor friend. Couldn’t read a word of it. 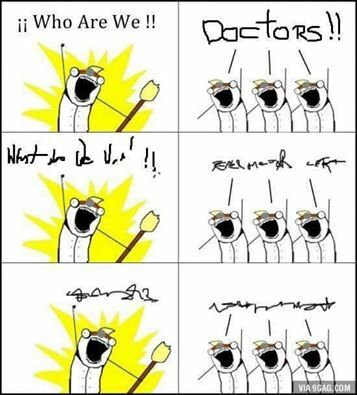 He wondered who could help him, then he realised that chemists (= pharmacists) seem to understand doctors’ handwriting. Took the note to his local shop. The pharmacist (chemist) said “Just a moment sir”, disappeared into the back of the shop, then came back with a bottle containing a coloured liquid. I guess that’s true of all countries, then (or several of them), because the same joke applies to Argentina! I think it’s because some of them are writing these things out in Latin, whether they can understand Latin or not.